A newly restored country house build around the turn of the century, the House on Chase Creek offers a country home away from home for those looking for a relaxing getaway. The house is located on a quiet lane overlooking an inlet. The rooms are furnished with antiques and there are yellow pine floors throughout. Three guest rooms are located on the second floor. The suite is on the first floor and comprises an adjoining sitting room with a cozy fireplace and a small outside patio. All rooms have private bathrooms. Downstairs we also have a sitting room as well as a sunroom. An extensive continental breakfast is served daily in the sun room and, with its panoramic view of Chase Creek it is also an excellent spot for bird watching. Golf, cycling, swimming and tennis are all available nearby. 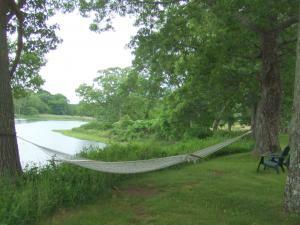 Another favorite activity on Shelter Island is exploring Mashomack Preserve. This Nature Conservancy preserve encompasses almost a third of the Island. We are open year round. The flowers of spring, the radiant colors of fall and the stillness of winter make Shelter Island a special place to visit any time of year. All New York transportation is within walking distance.